A French knot is a type of surface embroidery stitch used to make small, decorative knots in needlepoint. These easy-to-stitch knots can be done individually to accent a design motif or in clusters for added texture in a needlepoint project. French Knots are one of the simplest decorative stitches to work on needlepoint canvas. Most types of embroidery include them in stitch glossaries, and needlepoint is no exception. Whether you are a beginner in needlepoint or not, you will eventually come across a design or pattern that requires working a motif or area in one or more of these tiny embroidered knots. Start with a piece of practice doodle canvas and needlepoint thread and work as many French Knots as possible until the stitch feels comfortable. It may take a bit of practice, but once you master the French knot, it will become one of your favorite surface stitches, and you will want to use it in your every needlepoint project. As with other surface needlepoint stitches, French Knots can only be worked successfully on canvas that has been stretched in a frame or mounted on stretcher bars for stitching. Here's how to make great French Knots the first and every time--like a needlepoint guru! Bring your needle up in the area of the canvas where you wish to stitch the knot. Gently pull the thread all the way through until it is slightly taut. Hold this with your finger or thumb as you take the next step. 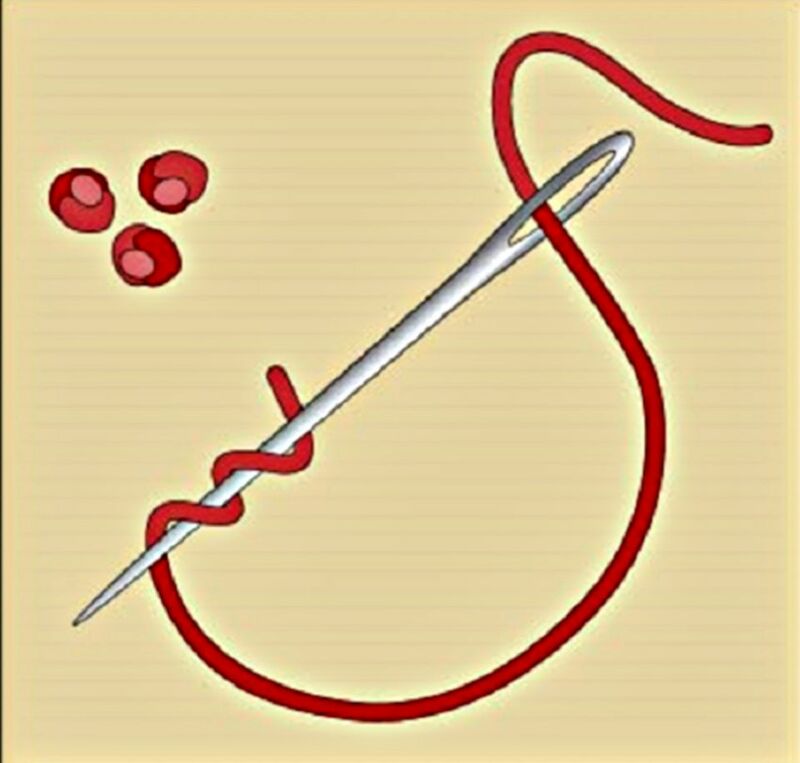 Wrap the thread around the needle as close to the tip as possible once or twice. Usually, only one time is needed for needlepoint as sometimes two can make the knot look too bumpy. However, just experiment until you get the desired look for your design and project. Insert the needle back down into the fabric in the same canvas hole. It works well as long as the knot is large enough to remain on top of the canvas. Just to be on the safe side, cross over a mesh thread as if you were making an upright straight stitch or half cross tent needlepoint stitch and go down in that hole or another one very close to the area where the needle was originally brought up through the canvas. While doing so, make sure the thread does not hug the needle too tightly, or your knot will be too small and too tight. Holding the thread end with your finger, gently slide the needle and its eye through the wrapped thread and down into the fabric. If you need to force the needle through the thread, or the knot pulls to the wrong side of the canvas, you have wrapped the thread too tightly and must pull out the knot to start all over again. Continue to work French Knots across the design area or finish off by tucking the needlepoint thread through a few previously worked stitches in other design areas on the back of the canvas. To simplify making French Knots, work them like regular tent needlepoint stitches, except wrap the thread around the needle once or twice as close to the point as possible just before going down diagonally across one canvas mesh to the wrong side. Make the French Knots as evenly and consistently as possible. Remember, a little goes a long way when using this specialty technique. Don't crowd them in a design area or they can quickly loosen and snag as you are working other stitches.